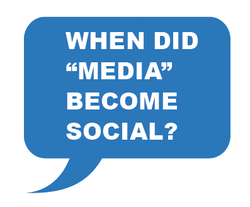 When did "media" become social? The term “media” was coined around the same time, as newspapers became the prominent means of conveying the “news”. It refers to a method of distributing information on many topics (sports, politics, religion, business, entertainment, etc.) to a large audience. Until technology caught up, newspapers were pretty much the only method for mass communication. Radio was an enormous leap forward, because with it, events could not only be communicated much more quickly, but people could also listen to them as they happened. Television, of course, was believed (at the time) to be the pinnacle of media. It involved both sound and sight, and brought images of the world, for better and worst, directly into our homes. However, none of these are “social”. They are all static, one-way avenues. We could rail at the radio and shout at the television, but no one heard. Ah, but the internet. That’s a game-changer. Immediate access to two-way communication was suddenly possible. Don’t like something? Tell the world on facebook. Love something, blog about it. What to form a movement, why not start on Meetup? Have a great idea? Let the whole country support you through a crowd funding campaign. Need a new job?... Well, you get the point. Before the web, it was almost impossible to be heard. Now that (pretty much) all media is social, it’s still hard to be heard because of the “noise”, the competition of everyone clamoring for attention. At first, it was thought (or at least hoped) the web would be the ultimate in “democratic” communications. One man, one voice. But, because of the democracy of the web, each man’s “one voice” has little impact. Just as politicians need many “middle men” to raise huge sums of money to be heard, to “get their message out there”, our new “social media” has created another new class of “middle men”. Men and women who know the (every-changing) rules of social media, and guide their clients so they can be heard above the noise. Social media can be a panacea for businesses with big ideas but little budgets. Rhode Island Creative Magazine (RICM) is a perfect example. With (for the most part) a volunteer cadre of dedicated writers, illustrators, partnerships with local cities and organizations, as well as formal and informal educational involvements, their vision of supporting and drawing attention to the Rhode Island creative industry is being realized. In fact, RICM is averaging 73% new visitors and usages each month! RICM is one of the better examples of meaningful, supportive social media experiments; and it’s working! All of us at the magazine what to extend our heart felt thanks to all of you who have helped us achieve everything we have to date. So, get on Twitter, Facebook, LinkedIn, Pinterest, Google+, Tumblr, Instagram, Flickr, etc., and hashtag #RICM to success! “Social media spark a revelation that we, the people, have a voice, and through the democratization of content and ideas we can once again unite around common passions, inspire movements, and ignite change.” Brian Solis, Engage: The Complete Guide for Brands and Businesses to Build, Cultivate, and Measure Success in the New Web.